Specially designed for iRobot Braava Jet 240 mop cleaner. Compatible Models: for iRobot Braava Jet 240 mop cleaner. iRobot Braava Jet 240 241. 2X For BLACK DECKER 20V Battery LBXR20 LBX4020 Li-Ion MAX 2.0Ah LCS1620 HT. Compatible with iRobot Braava Jet 240 mopping robot washable cleaning cloth. Compatible with iRobot Braava Jet 240 / 241 mopping robot. 3 Mopping Pads. Washable and reusable. 1 x Wet Mopping Pad. 1 x Damp Mopping Pad. Compatible with iRobot Braava Jet 240 / 241 mopping robot. 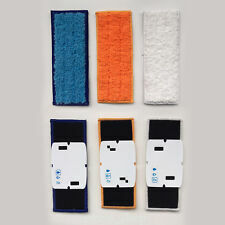 Compatible with iRobot Braava Jet 240 mopping robot washable cleaning cloth. 1 x Damp Mopping Pad. 1 x Wet Mopping Pad. 3 Mopping Pads. Washable and reusable. 1 x Carpet Table Sweeper Crumb Dirt Brush. Single brushed sweeper, for clean your table quickly and easily. Easy to open and empty. Material: Plastic. Fits Models V2940, and V1940. 6 Volt, 1300mAh Ni-MH Battery. GENERAL INFORMATION. Shark V1940 / V2940 / V2940C. HQRP trademarked products. Battery Capacity: 1400mAh;. Battery Type: Ni-Cd;. South Korea. This warranty is not transferable. New Zealand and. Australia . The Swivel Sweeper Max is powerful, swivels 360 degrees, cleans floors fast, is cordless and rechargable. Includes Four Quad-Brush technology which picks up on all 4 sides. Removable bristles allow for quick and easy removal of tangles. Model number V2940C. Shark Cordless Floor and Carpet Sweeper. Type of Vacuum: Sweeper. We needed an affordable, simple sweeper for daily cleanup to avoid lugging our vacuum out of the closet. Love my Shark! Minor signs of use and wear. Works great. Fit for iRobot Braava jet 240 5.3Ah wet and dry vacuum cleaner lithium battery with DC interface. Competible Models: For iRobot Bravva Jet 240 /241 /244 Water Spraying Robot. solar led string lights. USB String lights. Automatic Robotic Vacuum Cleaner Sweeper KONKA KC-D1 Intelligent Sweep Robot ! Fit for 2039A, 2039, 20391, 20395, 2039Q, 2039T, 2039W. Replaces Part # 1611297 & 1611298. Note:The real color of the item may be slightly different from the pictures shown on website caused by many factors such as brightness of your monitor and light brightness. 7 to 1 Concentrated Non-Toxic Gentle Cleaning Solutions - safe for family & pets. Hard Floor Solution, Carpet Solution, Spot Remover and Polish Solution. The attached photos are for informational purposes only. Perfect for Tile, Vinyl, Wood, or Low Pile Carpet. Soft rubber wheels and brushes conform to floor surface. Easy-open dual debris bins feature one-touch emptying doors. Brush section 8-3/4" long. Entire unit. Shark V2945 / V2945Z Floor & Carpet Sweeper. Shark V2945 / V2945Z Floor & Carpet Sweeper. Battery Capacity: 1200mAh;. Compatible with following P/N: Shark XB2950;. Battery Type: Ni-Mh;. High level of service ;. Specially designed for iRobot Braava Jet 240 mop cleaner. Compatible Models: for iRobot Braava Jet 240 mop cleaner. iRobot Braava Jet 240 241. 2X For Ridgid R82059 Hyper Li-ion 6.0Ah 12V Battery AC82049 AC82059 130220001 EG. Slim 10" x 8 1/2" x 3" design has 39" swivel handle to reach under furniture and into tight spaces. Helpful Links. I DO TRY TO GIVE AS MUCH DETAILED INFORMATION AS POSSIBLE FROM THE ITEM ITSELF OR FROM INFORMATION ON THE INTERNET. ON THE ITEM ITSELF. AFTER ALL I LISTED THE ITEM WITH HONESTY. IF YOU WANT NEW BUY NEW. 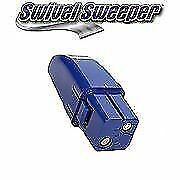 SWIFFER SWEEPER DRY + WET SWEEPING KIT INCLUDES SWEEPER 7 DRY 3 WET CLOTHS NEW!